It was through the non-aggression principle that I first came in contact with anarcho-capitalism, so therefore I would like to start by explaining what it means. The non-aggression principle means that no person has the right to physically harm anyone else, or use force or coercion to impose their moral compass regarding how to live, upon anyone else. It means that you have the right to your own moral compass and preference of any religious, cultural and ideological positions without anyone having the right of forcing you to abandon it. It also means that you don’t have any right to use force or coercion to push your views on someone else (children are individuals too, so this also applies to them!). Non-aggression principle also means that you have the right to use force to defend yourself, but you never have the right to initiate violence and coercion on anyone. The non-aggression principle is a logical elongation of the other foundation of anarcho-capitalism, which is private property. The right of private property is based on every human being owning their own body and the product of all their actions. This means that your body and what you produce is your private property and that you have the right to defend your private property if someone threatens it. It also means that you own all the negative consequences of your work and actions and that you are fully responsible for what you do to others. Anarcho-capitalism means that no one has the right to initiate violence or coercion against another person’s property, thoughts, opinions, or beliefs, and you have the right to defend yourself if this is the case. This is a very important conclusion that I want you to retain when we come to certain moral dilemmas in this part and the next parts. The Swedish political parties from an anarcho-capitalist point of view. There is little difference between the political parties when you consider how willing they all are to initiate violent force against peaceful people who do not act as they would like. The differences are only in which parts of people’s lives that they want to impose their morals. For example, Feminist initiative, the Left Party and the Sweden Democrats are close together on this scale to emphasise that there is no difference between these parties other than the areas in which they wish to practice violence and coercion in people’s lives. None of the parties end up on the top half (above the dashed line), because they are all in favor of using a monopoly of violence to limit people’s freedom. When it had become clear to me that all forms of violence and coercion is morally reprehensible, I had to re-evaluate many things that are considered to be the norm and the prevailing truth in society, and I became aware of the existence of a better and more consistent way to live with other people than the system we have today. I intend to give examples of how I reason by describing various issues through my anarcho-capitalist view and compare it with the perceptions enforced by current Swedish political parties, beliefs and societal norms. 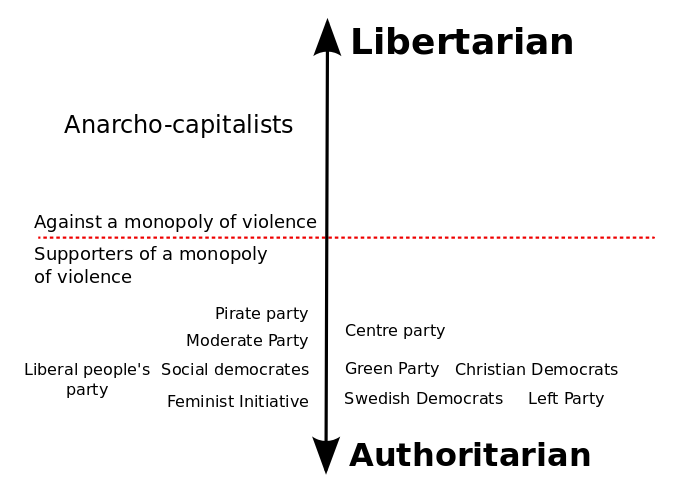 The first thing I want to do is to show what the Swedish political system looks like from an anarcho-capitalistic viewpoint, therefore I have taken the liberty to illustrate my own version of the political scale to fit in better with the anarcho-capitalistic viewpoint and make you aware of that there are other dimensions than the left-right scale. In my anarcho-capitalist worldview there is only one scale that is important and that is the vertical libertarian-authoritarian scale (see picture). As you can see, all Swedish political parties (I have chosen to include Feminist Initiative and the Pirate Party as well although they are not currently represented in parliament) are in a lump on the bottom half of this scale with only small differences between them. There are differences between the political parties, but only in regards to in which areas of people’s life they want to use force and violence to restrict their freedom. Some parties want to put up barriers for migration, others want to impose coercive quotas and prohibit consensual sexual exchange between people etc. However, from an anarcho-capitalistic viewpoint, these differences doesn’t matter because all of the parties want to use a state apparatus, ie a monopoly of violence, in order to finance their operations by stealing from people and use the state monopoly on violence to impose their morality and ideology on the individuals that have different life philosophies and moral compasses then them. States currently have a monopoly on violence and coercion. To understand this better I would like to give an example. Most people do not think it’s okay for a person to point a weapon against someone else in order to deprive that person of her freedom, money, property or what that individual considers to be quality of life. This is called theft and slavery, and is for most people morally reprehensible. Many people can see that this happens in countries with dictatorship, but few people realise that this is exactly what a democratic state also does. Instead of a person aiming a weapon against her neighbor to force him into her own philosophy of life, the person can instead use her “right to vote” for the monopoly of force to deprive her neighbor of freedom, money, property and quality of life. This leads to a conclusion that can easily be shortened to one sentence; democracy means that it is the majority who oppresses the minority. This is why I have come to the conclusion that it is morally reprehensible to legitimise this monopoly of violence by voting. If I use my “right” to vote and end up in the minority, I have given legitimacy that it’s okay to oppress me and everyone else in this group of minorities and if I am voting with the majority, then I become an oppressor of the people who voted for the minority proposals and people who for various reasons chose not to vote. This is something that I do not want to do because I think that it is never okay to oppress another human being. My second argument for not voting is that I do not consider it to be my right to impose my moral compass, opinions, and political ideology on someone else even though others want to do that to me. Thank you for your kind words :)!